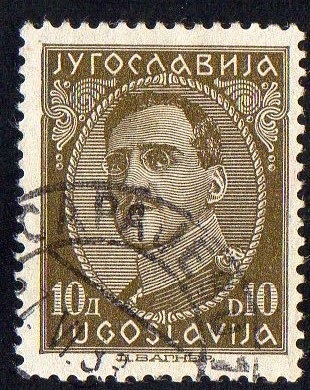 Today , I'll present some stamps from Yugoslavia and Colombia.. 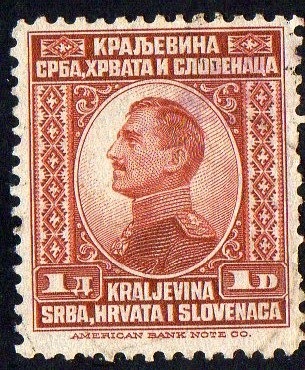 The group of stamps presented above is a mix of two series... Two incomplete series , one (8) [the 2p stamp is missing] representing King Alexander of Yugoslavia and the other (5) [the 10d stamp is missing] King Peter I of Yugoslavia...they are grouped in just one series in the Scott Catalog because they all present the label "Kraljevstvo", below the King's picture... As you can see in the stamp at the right , the label is "Kraljevina" , and it belongs to another posterior series equal in all other labels and pictures..
stamp from the series (5) "King Alexander (1923)"
Series (14) "King Alexander (1931/1934)"
five stamps from the "King Alexander Memorial Series" (14) from 1934.. Complete series from 1899 "General José Maria Córdoba" ; it is a series from Colombia , but also from the Antioquia Province..